Is there any tool or script through which I can extract/convert character sounds from PS3 Resident Evil Darkside Chronicles? I’m pretty sure that they are stored in one of these formats, but I don’t know how to extract/convert them. Thanks for your time and any help! Last edited by NightFuri0us on Fri Nov 09, 2018 9:58 am, edited 1 time in total. brendan19 wrote: The .bnk files can be played/converted with vgmstream. 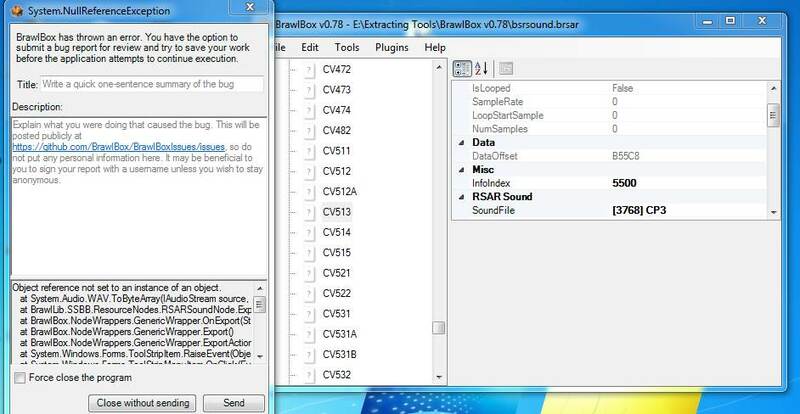 The BRSAR can be opened using BrawlBox and you can export the sounds as .WAV files from it. Thanks for your reply. Can you be more specific please about what steps I need to do in vgmstream. As for BrawlBox and BRSAR, this didn't help. Everytime. when I try to export any sound to wav, I get an error. your sample, just Google it. "footbar+plugin" works but i hear some noise. Thanks, it's actually works for some BNK sounds and they are play well, but for others, sounds are playing too quickly as accelerated the Chipmunks style (unfortunately, those that I want exactly to get and gave as examples). So, this topic still actual and I continue to search help.